Heel pain or ankle pain can be caused by a number of things and we recommend to see your podiatrist for a diagnosis. At The Foot Clinic we build better bodies, from the feet up! Once we know what causes your heel pain or ankle pain, we work out a treatment plan. Depending on the underlying cause, your podiatrist will explain the treatment options. At The Foot Clinic, we’re all about giving you an outstanding service, in a friendly and caring environment. Heel pain can be caused by heel spurs or by Plantar Fasciitis. Your plantar fascia is a band of tissue between your heel and the ball of your foot. When the tissue is strained, small tears can occur and they can get inflamed. This is when you would feel pain along the arch of your foot. The risk of Plantar Fasciitis is higher if you are an athlete, pregnant, obese or suffering from flat feet. A heel spur is an additional bone growth under the heel bone, and as a symptom, it will often be linked to Plantar Fasciitis. Thor Laser Therapy uses infrared light, to trigger healing at the cellular level in your body. Officially called Thor Low Level Laser Therapy or LLLT, the therapy is ideal for joint and tendon problems. Achilles Tendinopathy is another cause of heel pain or ankle pain. When a tendon is ruptured, inflamed, or starts showing signs of degeneration, you will feel pain just above your heel or in your lower leg. If your Achilles tendon is hurt, we recommend that you see your podiatrist as soon as possible to get a diagnosis. At The Foot Clinic we have helped many patients with this type of heel pain, including athletes. Sever’s Disease is also a potential cause of heel pain, and is typical in children going through a growth spurt. Children between 8 and 15 can put excessive force on the “growth plate”, before it has totally hardened around the age of 15. That excessive force can cause an inflammation and heel pain. It would usually disappear after the age of 15, and your podiatrist can help your child with the choice of proper footwear for sports. With heel pain caused by Sever’s Disease we would also check for flat or high arches, and for leg length. Another typical cause of heel pain is a fracture of the heel bone. If you feel pain, and notice swelling, then we recommend to have the problem diagnosed at The Foot Clinic. A fracture could be a small crack in the bone, or a shattered bone. Once our team has assessed your fracture, we will propose the right treatment plan for the best possible recovery. Your treatment will be supported by a clear diagnosis and X-Rays. 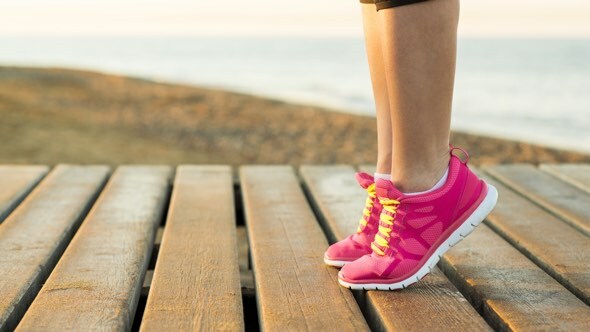 When we work out a treatment plan, the goal is always to reduce the pain and discomfort, and to return to the best possible function, so you can live an active lifestyle. At The Foot Clinic, we use the latest innovative technology to treat heel pain and for other podiatry treatments. Low level laser therapy for example, helps improve tissue repair. This is how we reduce inflammation, reducing the pain and stimulating the natural healing process. We are a team of experienced podiatrists, and are very passionate about fixing feet. We have helped numerous patients, including athletes, and we keep improving our service levels and expertise. That’s also why we are committed to further education at The Foot Clinic, and to introduce the latest available technology. So if you experience heel pain or ankle pain, book an appointment today! 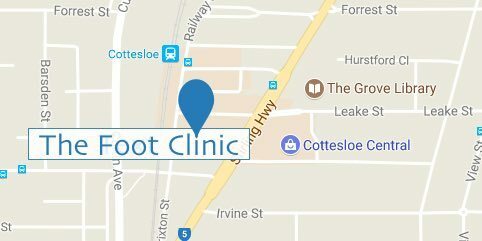 Our practice is conveniently located at Cottesloe Central, close to the train station.